Lock in a great price for Pol & Grace Hotel – rated 8.9 by recent guests! The staff was really nice and helpful. The breakfast was good, not a lot of choices but was enough. Everything was clean and comfortable, while the staff was very friendly! The location is great, the hotel is next to the Pl.Molina station. There is also a nice bakery nearby. The staff was great and helpful, the room was spacious enough. I also loved the roof, unfortunately could not enjoy it enough due to cold weather. Personnel is very friendly. Cleaning process was very accurate and effective. The staff always assisted us whenever we required By displaying a genuine smile. In addition, the hotel was close to the metro station and to the most emblematic streets. Breakfast was excellent and so was the host. She always had a lovely smile and was forthcoming!! Front desk staff very friendly and helpful! Clean bathrooms, comfortable bed and pillows! The staff is very friendly and super helpful! The bed was very comfortable. loved the location - hidden Barcelona - staff were exceptionally helpful and friendly - don't change anything !!! Ceasar and all the staff were very attentive and friendly. The bed was awesome. Pol & Grace Hotel This rating is a reflection of how the property compares to the industry standard when it comes to price, facilities and services available. It's based on a self-evaluation by the property. Use this rating to help choose your stay! One of our best sellers in Barcelona! Pol & Grace Hotel is located just 350 feet from Barcelona’s Plaça Molina and Sant Gervasi Train Stations. It offers spacious, air-conditioned rooms with flat-screen satellite TV and free Wi-Fi access. This modern hotel features a library and an area displaying works by local artists, as well as a free work area. A free coffee and tea service is offered from mid-morning onwards. Each soundproofed room at Pol & Grace Hotel has functional, modern décor and includes a small fridge, a free safe and a welcome gift. The fully equipped bathrooms come with toiletries. A varied buffet breakfast is served every morning. Room service is also available. The hotel has a 24-hour reception with car rental service and a tour desk. Private parking is available on site. 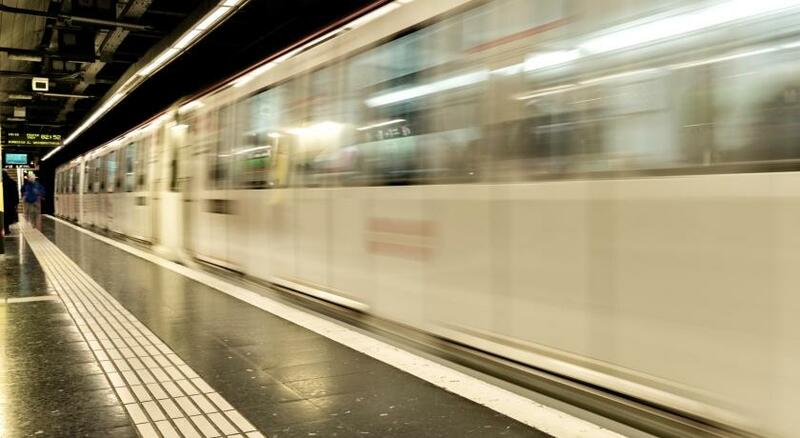 Fontana Metro Station is 1,950 feet away, and offers direct access to Plaza Catalunya, Las Ramblas and Parc Güell. 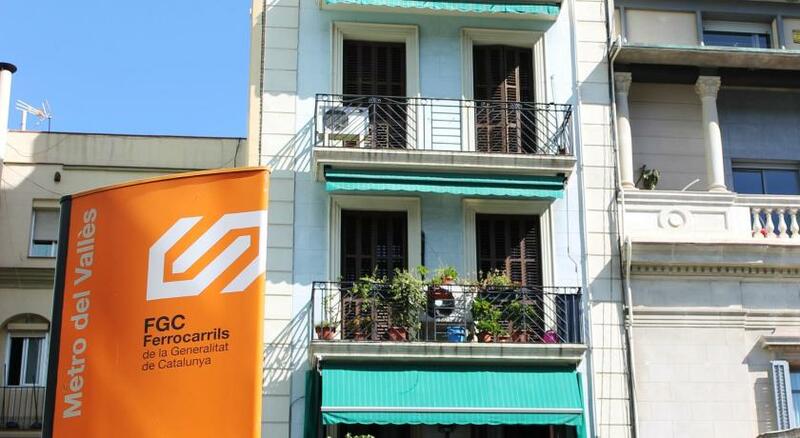 The popular Gràcia district is within a 2-minute walk of the property and has a range of shops, restaurants and lively bars. When would you like to stay at Pol & Grace Hotel? This spacious, air-conditioned room includes flat-screen satellite TV and free Wi-Fi access. Soundproof and modern, it includes a minibar and safe. The private bathroom comes with toiletries. This single room features a mini-bar and air conditioning. This twin/double room has a sofa, mini-bar and air conditioning. House Rules Pol & Grace Hotel takes special requests – add in the next step! Pol &amp; Grace Hotel accepts these cards and reserves the right to temporarily hold an amount prior to arrival. Pol & Grace Hotel accepts these cards and reserves the right to temporarily hold an amount prior to arrival. Needed to keep window closed because of traffic noise. The staff were fantastic, very friendly and helpful; they called a taxi for me at 5:30am and another one later for my friends. I also really enjoyed the free coffee at any hour, quite tasty. The value for the money was fantastic. The location was within 30sec walk to the metro line and within 15 minutes we were in the heart of town. Doesn't look in reality that nice like in the pictures (overused stuff's).It's more like a 3 stars hotel, comparing with others hotels from Europe. Shower leaked onto main bathroom floor in our unit and it could get noisy at night from the street traffic at times. The room was a quite dated, but there is a renovation going so maybe they will update all rooms. The floor was a bit dusty. The staff was excellent, everybody was super friendly and helpfull and really did a superb job!!! Rooms were clean, location good near metro and breakfast was very taste (e.g. youghurt and fresh fruits). We didn't have a dressing. Room on street-side - I'll pick a different room next stay. Quiet and very close to metro. I already know this area, and location is good for me. The staff are always positive and helpful. I like the little coffee area on the ground floor. Comfortable bed and excellent shower. Friendly staff, keen to keep our bags until check-in time and after check-out. Bed was very comfortable. The safe in my room did not work and WiFi in my room kept dropping in and out. My room was also poorly sound-proofed, I could hear my neighbour speaking on the phone until 2 AM. The one elevator servicing all floors was quite slow at times. Very friendly staff, and the complimentary coffee, tea, water in the lobby were much appreciated. The hotel has a very casual, friendly feel to it, which I liked a lot. It is also close to a subway stop and taxi stand, so getting around was very easy. The facilities are limited and the public areas are not very big. The room while offering all comforts is not in my opinion the room of a 4 star hotel. The shower head and hand held spray was old. This hotel (and I do recommend it) is more like a 3,5 star hotel. The wifi connection stopped working the morning I was leaving which was a bit inconvenient because I did not check out until quite late (I did not contact reception as I could see they were very busy). It is comfortable and the room was a decent size and very quiet. It is in the centre of Barcelona with good connections for tourist sightseeing (although not my purpose on the visit). Very importantly it has its own small car park. The staff are charming.